February, for most people, is something to survive, not enjoy. It's dark, the weather is usually at its worst and it seems like spring will never come. If it wasn't for Valentine's Day smack in the middle of the month, the prevailing sentiment would be to drop the whole thing and go straight into March. But for me, February is the bright spot of the winter months and one of my favorite times of the year. Why, you might ask? Well, because it's my birthday, an oppportunity (some might say it borders on a gun-at-their-head threat) for everyone to express their love and devotion. At least that's how I like to think of it. After an attack of indecision that went on for several days, we decided, on the excellent suggestion of my brother's lovely bride, to go to Toro Bravo with a pre-dinner stop at The Secret Society, the jewel-box of a bar on the second floor of the same building. With a cocktail list straight out of the 1920s, its dark corners beg for illicit assignations and the quiet efficiency of the staff carries a "say no more" assurance. Since our visit they've also added more substantial offerings to their menu of bar snacks, so I'll be reporting back soon. 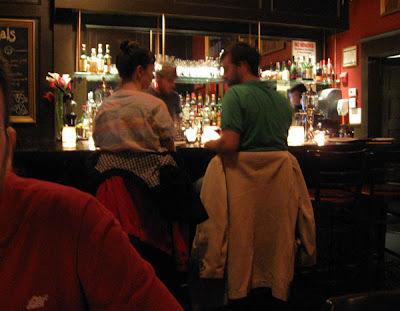 Then all we had to do was wander downstairs and take our seats when our shared table at Toro Bravo opened up. 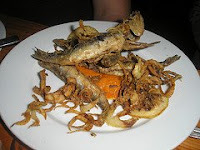 We immediately ordered a bottle of a slightly sparkling white called Txakoli and a plate of salty, perfectly fried whole anchovies with fried fennel and lemons. 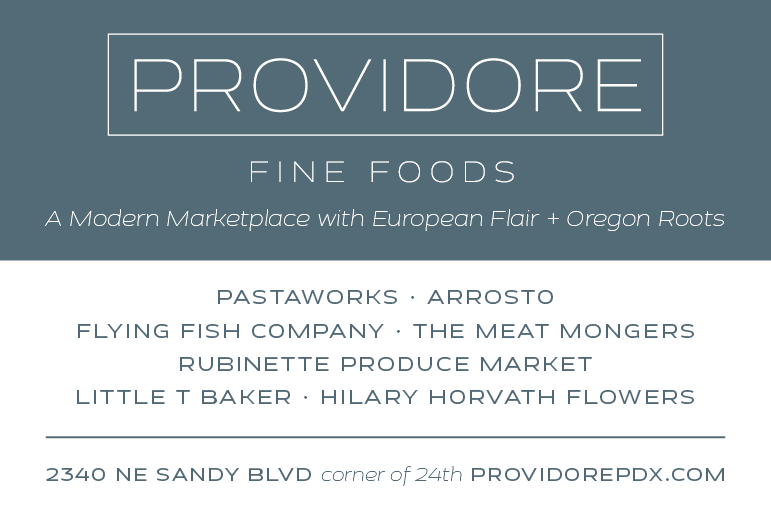 This is one of the best apps on the planet, and it vies with their salt cod fritters and aioli for my "best of the menu" rating. But just because they're fabulous didn't stop us from ordering tons more, including manchego and paprika fritters, lamb rilletes, sauteed brussels sprouts with bacon and cream (almost too much goodness in a bite), squid ink pasta (another highlight), calamari a la plancha, oxtail croquettes, seared scallops with romesco and jamon-wrapped chicken with manchego. And somewhere in there we switched to red wine, a terrific bottle of '05 Finca Sandoval my brother had pulled out of his stacks that had an earthy gravitas befitting some of the heartier plates. And since we're a family that just can't say "Enough, already!" 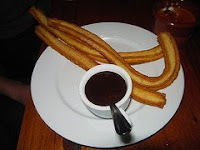 (and, after all, it was a birthday celebration), we also went for desserts, starting with the churros, a fried wand of dough that you dip in the pot of dark chocolate alongside. Crisp and crunchy outside with a sweet, soft center, these are some of the best I've had anywhere. The olive oil cake was heavenly as well, light yet substantial enough to support the apple-pear caramel sauce and whipped cream that came with it. The best part of the panna cotta with caramel sauce was the sauce, the custard being too thick and slightly grainy, alas. 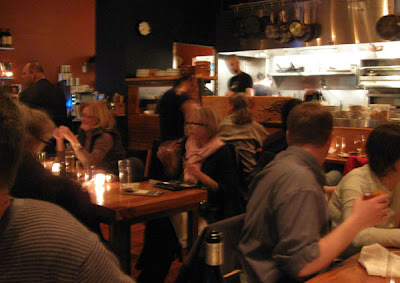 And I have to mention that, walking in, I almost didn't recognize chef and owner John Gorham standing at the grill in the back, since he's merely a whisper of his (formerly quite substantial) self. Apparently a bout of surgery caused the initial drop, then a combination of working out and training for the Leukemia & Lymphoma Society marathon has him in the "tall, svelte guy" club. But those tats still look hot, man, I gotta say! Details: Secret Society Lounge, 116 NE Russell St. Phone 503-493-3600. Toro Bravo, 120 NE Russell St. Phone 503-281-4464.